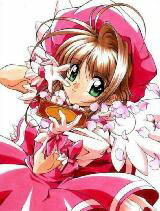 You are going to Watch Cardcaptor Sakura Episode 58 English dubbed online free episodes with HQ / high quality. Stream Anime Cardcaptor Sakura Episode 58 Online English dub Sakura and Double Trouble, Eriol casts a spell on Kerberos and Yue so that they are unable to revert to their original forms, much to Sakura’s dismay, since it is understandably difficult to hide their true forms for long. Fortunately, Toya and Fujitaka are out for the day, and Sakura has them help around the house while reminiscing about their time with Clow Reed. Eventually Sakura gets the idea of using the Shield card, which can nullify and protect people from magic, and the two guardians are able to revert to their original forms. Eriol becomes impressed by Sakura’s increasing skill, while Kero begins to wonder who besides Clow Reed would have the power to prevent them from transforming.